Rick Wrigley recently celebrated 50 years with WUSC, and his experience with local radio stations and online radio has given him perspective on the current issues radio faces, as well as some of the things that need to be done to stay relevant. Rick Wrigley has been in a loving relationship for 50 years – and his lover? Radio. That relationship has been tested as computers have replaced many DJs and as the programming has shifted from the airwaves to digital streams. But Wrigley is still at it, whether he’s at the working end of a microphone or the front end of a computer. Every Monday, from 10 a.m. to noon, he spends two hours on the air at WUSC, the University of South Carolina’s student-run station. His show, “50’s, 60’s and Soul,” blends the high-tech equipment of modern radio with the music and tone of the late 1960’s. Rick Wrigley is on the air on WUSC 90.5 every Monday from 10 a.m. to noon. “This is what radio is about, this is who I want to be like,” said Kate Appelbaum, WUSC’s station manager. Wrigley, who has an electrical engineering degree from USC, also helps keep WUSC and two local commercial stations on the air. Three days a week, Wrigley also broadcasts out of his house at his website, Our Generation Radio, and in the UK on Replay radio online. 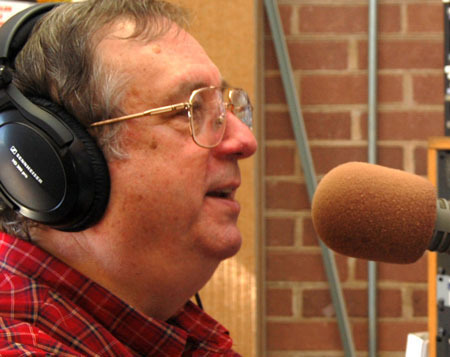 And if you talk to him for just a few minutes, as we did, you’ll hear his passion for radio through the stories he has from five decades of Columbia-area radio. How has the Rick Wrigley that came here to study chemistry in 1963 changed since then? How does all of that translate to a career in radio now, in 2014? The radio studio is filled with technology that helps make radio broadcasts smoother and easier than ever. Rick Wrigley integrates technology and the classical style of radio broadcasting from the 1960’s to make his show a retro hit on WUSC. I know you mentioned automation, but other than the computerized automation, how has the technology changed the way you view radio? Very briefly, with all of your experience with the technology and broadcasting using that technology, where do you see radio heading in the future? Radio is going to go either one of two ways. It’s either going to find a way to differentiate itself from the music streams, the other music sources, be it Pandora, or iTunes, or Rhapsody, or whatever, and come back into a position of prominence and relevance to the target audience. Or it’s going to further diminish into a non-relevant source of entertainment, just another source of music out there or entertainment out there. It depends on which way it goes. … So we may see a shuffling of things in the future.